A bold blade and contoured grip could make Kershaw's Flitch your new favorite EDC. With a modified drop-point blade, top swedge, and strong finger contouring, the Flitch offers a tactical look at a value price. The eye-catching blade is made of 8Cr13MoV stainless steel, which can take and hold a sharp edge, yet resharpens easily. A bold blade and contoured grip could make Kershaw &apos;s Flitch your new favorite EDC. With a modified drop-point blade, top swedge, and strong finger contouring, the Flitch offers a tactical look at a value price. The eye-catching blade is made of 8Cr13MoV stainless steel, which can take and hold a sharp edge, yet resharpens easily. 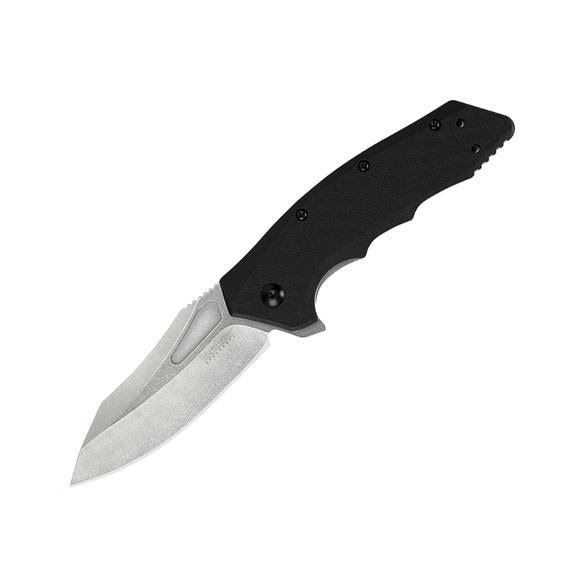 Then Kershaw&apos;s heat treatment brings out the best in this top-value steel. The blade is stonewashed to help hide hard use scratches. The result is a very distinctive looking blade that performs well, too. The handle is glass-filled nylon, textured and chamfered for a solid, comfortable grip. Pair that with the deep finger grooves on the underside of the handle and the Flitch offers an exceptionally secure grip. A sturdy liner lock keeps the blade in place during use, then releases easily when you&apos;re ready to EDC it. Equipped with SpeedSafe assisted opening and a built-in flipper, the Flitch opens quickly and easily. For convenient carry, it also features a reversible, deep-carry pocketclip that enables the knife to ride well down in your pocket, nice and secure. Locks the blade open during use; one side of the knife&apos;s steel liner, the steel plate to which the handle scales are attached, moves into position behind the blade to securely lock it open.